We had a wonderful family reunion and my mother in law can’t stop thanking all of us for giving her a big surprise on her 85th birthday. We stayed at the Planet Hollywood Resort and the staff were absolutely wonderful. We had organized a dinner away from the rest of the guests, the resort arranged it outside the dining area where that area was just for us. On top of that the birthday cake was complimentary as the chef said that not many families bring their elderly to celebrate their birthday at the resort. Yesterday, when I went to the ladies section for the security check at the Goa International Airport, the young ladies had no concept of a queue. A white woman and I were waiting for our tun to get the tray to put our bags and laptops when the younger lot, just pushed their way in. When the 3rd youngster came in front of me, she had the audacity to push me and tell me ‘excuse me” and by now I’m angry and asked her where needs to go. She tells me that she needs to catch a flight. I asked her “And why do you think we’re waiting in the queue? Just time pass or what?” She just ignored and continued to pull the tray that was meant for me. I got so angry and told her to join the queue… and she muttered “yeh bhudhe log ke pass tameez nahi!” and went back. What is India heading to? Day 22 is taking you to Gujarat, yes once again! The letter is W and finding a paratha or roti with W has been not too easy. There’s Warqi roti but seriously enough of oil and ghee! It requires a lot of ghee to get those perfect layers. We’ve also become so tired of eating flatbreads everyday that our tummies are screaming for some rice or rather khichdi. 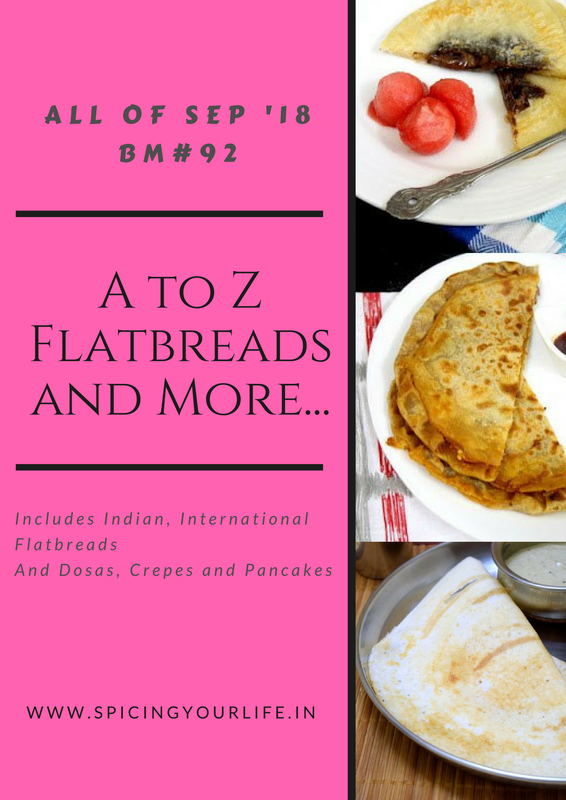 Letter W doesn’t give you too many options besides using the word wheat or any other food beginning with W… umm watermelon paratha, not too sure. Anyway wanted something traditional and not modern. I wanted to prepare khakhra and kulcha for this marathon. Prepared K for Kulcha so was left with khakhra. So I thought its now or never… so W for Wheat Khakhra it is. You may retaliate and tell me but they all are made of wheat… I know, I know… but did you know now there are farali khakhras, jowar khakhras, multi grained khakhras, etc. There are so many varieties that one can get lost in trying to choose which ones to try. Have you heard of pav bhaji, schezwan, idli flavored ones? I think more than the state of Gujarat, Mumbai takes the cake when it comes to inventing new flavors for khakhras. Its only recently that we now get ready made khakhras readily in Kenya. Before it was like a whole lot would come from India and disappear in a jiffy. Then we’d have to wait till a ship brings in another load. Now khakhras are made in Kenya too.When we couldn’t buy khakhras as they were not available readily, my mother in law would make them from left over rotis (rotlis). Several times I also have made masala ones. However making khakhras at home is a tedious job, needs a lot of patience. How come we get uniform extra thin khakhras in the market and home mades ones are slightly thicker and never the same size? Well they are made in an automated machine. Check out this video how they are made. Whenever I have extra rotis, I make them into khakhras for tea time snack. So if you want to try making khakhras at home or use your leftover rotis, then check out the recipe below. I love serving khakhras with a special khakhra masala. I must admit I’m quite partial to the ready made ones as they are extra thin and so flavorful. Knead the dough till it becomes smooth. She it into a ball and rub little oil over it. Heat a tawa over medium heat. Roll one dough ball in the flour, press it gently between your palms. Roll it into a circle of about 6-7 inches in diameter. Put the rolled rotli on the hot tawa and let it roast for 1-2 minutes. Flip it over and let it roast for 1-2 minutes. Put the rotli into the open flame using tongs and let it puff up. Quickly turn it over and leave on the flame for just a few seconds. Remove from the flame and put it on a plate. Smear with little ghee or oil. Repeat steps 10 to 17 with the remaining dough. Now take a clean kitchen cloth, potato masher or the bhakri press. Put one rotli with the ghee or oil smeared side on the tawa. Press lightly with the cloth or whatever you are using. Press gently the edges especially till it becomes a little crisp. Smear little ghee or oil on the top part. Flip it over and press till its crispy. Repeat steps 20 to 24 with the remaining rotlis. Store in an airtight container when the khakhras cool down. Serve with tea, on its own or with a khakhra masala. Grind the peanuts to a powder, don’t grind it too much otherwise it will clump up. Grind the sesame seeds coarsely. Grind the desiccated coconut to a coarse powder. Heat oil in a wide pan over low heat. Add turmeric powder, asafetida, the chili powders, dhana jiru, peanut powder, sesame seedpowder and coconut powder. Take the pan off the heat. Add sugar and salt. Mix well. If using citric acid, add it and mix well. Store the powder in an airtight container till required. Spread a bit of ghee or butter over the khakhra. Sprinkle the khakhra powder and enjoy. Dhana jiru is a roasted mixture of dry coriander and cumin seeds to the ratio of 1:¼. Both are ground together and used in almost all the curries, dals and sabjis in the Gujarati Cuisine. Smear little oil or ghee on the rotlis before roasting them. Without that the khakhras turn out hard. Add spices and flavors of your choice. khakhras are such a good option for snacks. and your khakhra masal recipe sounds so flavorful and delish! Bookmarking this!! Try it Sowmya.. its very nice. Crispy wheat Khakhras looks so tempting.. Seriously they are just prefect to pack for a long travel na. I can have those khakhras simply with some pickle. Mouthwatering already here. Thanks Priya.. I love khakhras. and it makes good travel food. As you mentioned we get different types of khakhras and they are a great snack on to go as well. To make them at home is a tedious task but ghar ka taste alag hai na? You presented them very beautifully. Thanks Harini… yes I usually just make left over rotis into khakhra. Didn’t know making khakhras need this much patience. The khakhras masala sounds so yum and flavourful. They both would go so well together. Khakhras take a long time as they have to be completely crispy so they stay for weeks. Try the masala out..its really yummy..a bit like podi masala. This khakra recipe looks so crisp and perfectly made. Perfect for travelling food. Thanks Preeti and yes they are perfect as travel food. Khakhras surely take lot of patience and you have got it done so well..so lovely to know your MIL enjoyed. Its sweet to know you guys made her so happy. As the hotel said, doing it for elders is an awesome thing all of us must remember to do. Khakhras are tedious to make , specially its difficult to replicate the market ones . I have lots of Gujju friends , one makes the khakhras with the Do pad ki rotis and the other one makes in a griller toaster . It’s truly amazing how our everyday rotis can be transformed into a snack . Love your khakhra version with that chutney . Thanks Vaishali.. I like the do pad ki roti idea. Nice to read about your holiday and MIL’s birthday party! Such a nice gesture by the hotel too! And these khakras look so crisp and absolutely inviting.And the khakra masala is being bookmarked.. Sounds so flavorful Mayuri. Thank you so much Padmajha. The masala is flavorful and you can add your own spices too. We love khakras but we don’t get here. I have made once or twice but yes as you said they are a tedious job. I would love to try your version though as they look perfect and crisp with a cup of tea. Renu, I use to make them when we didn’t get khakhras here. I usually would make them from left over roti.. they have be rolled out thin. khakhras looking so crisp and crunchy. with tea I want some. I too made them but found it a tedious process to make. lovely clicks for this khakhra. Thanks Bhawana, yes it takes a long time to make them and when I watched a video on how its made commercially, its so easy and hubby says why bother with complicated stuff when you get ready made. Growing up I have eaten a lot of khakhras but has been a while now. Looks so delicious and I am not sure if I can nail it like you did. I will have to give it a try soon! Thanks Sandhya, with so many ready made ones I rarely make them at home unless I have leftover roti. My favorite snack too Ritu. Its good that now we get them all over India unlike a few years ago.